The Dercum Society is devoted to offering hope through the compassion of community & help through a dedication to providing peer-reviewed scientific information to patients, their families, physicians, and medical researchers. Dercum’s Disease is so much more than just unexplained weight gain, yet that is typically the first symptom most patients notice. Learn more about the many ways in which Dercum’s Disease presents itself and affects the human body. If you think you might have Dercum’s Disease, it’s important you begin to track certain key metrics that a wide variety of medical specialists will require. We’ve set up a guide to get you started and help you keep an open mind. When diagnosed with a rare disease, it’s natural to want to find an expert. We’ve put together a guide to put your mind at ease and help you find the best possible care close to home. It is remarkably admirable that even those confronted with a debilitating disease, are often the first to want to help others. That’s the Dercum’s community’s greatest asset! Learn how you can best share your time & talents to help where it is needed most. When it comes to the pain of Dercum’s Disease, every little bit of relief makes a big difference. With the help of both doctors and patients, we’ve compiled a guide to small, simple lifestyle changes that might prove helpful. Every little bit helps! We’re devoted to offering scientifically sourced information to patients everywhere. Dercum’s is about so much more than just painful weight gain. The diagnostic process is essential to discovering the true cause of your discomfort. We’re here to help you find quality care close to home. It’s admirable to want to help others like you. Here’s how. These small simple steps might help improve your quality of life. what is it & what causes it? 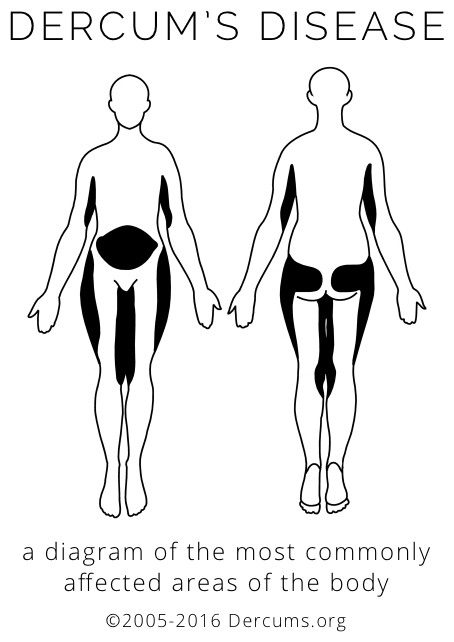 Dercum’s Disease is an incredibly rare genetic disease that mutates fat cells, causes excessive weight gain in unusual patterns, can lead to the formation of painful fatty tumors, impairs the immune system, and in certain rare cases, also mutates and alters the function of the nervous system. In short, it is both painful and disfiguring. Unfortunately, despite having been discovered well over a century ago, little research has been conducted and no cure has been found. The constant hallmarks of the Dercum’s patient are excessive inexplicable weight gain and the formation of excruciatingly painful lipomas. These are often the first symptoms patients notice, which drive them through a diagnostic process that can take many years. All too often patients are told the weight gain is their fault, or that lipomas simply shouldn’t hurt. Understandably, this can be both frustrating and disheartening as the disease continues to progress, the pain continues to worsen, and additional complications begin to appear. We hope you’ll browse through the site to learn more about this rare disease. Unless otherwise noted as anecdotal, all of the information has been sourced from peer-reviewed medical journal articles documenting the few multi-year clinical studies of the disease. In most cases, we have worked with the studies’ authors in order to translate their work into “layman’s terms”, helping to make this vital scientific data available to the general public. For medical professionals, we urge you to take advantage of the many links to the various articles used as reference materials. It is our belief that the greatest impediment to improving the lives of Dercum’s patients is simply a lack of awareness. It’s impossible to accurately diagnose a disease if you don’t even know that disease exists. Let’s fix that together and help bring hope to patients of this debilitating disease.